The Nightmare grows stronger with each committed atrocity. And where she grows, so do her Courtiers. From the far reaches of the Shiverpeak Mountains to the countryside villages and isolated farms of Queensdale, and to its dark heart in Calendon Forest - her agents often scattered thinly throughout the lands, yet each band or lone individual striving to further the Nightmares' grasp in their own condemnable ways. Originally, the Canticle of Thorns was led by a Knight called Cardinalis, the Knight of the Sacrament, and his followers, who were involved in a plot to attack and destroy the grove, and with it the Pale Tree. During a battle with the Caledon Wardancer Kindred and a small army of mercenaries the Nightmare Court plot was foiled causing Cardinalis and Vairin, his second in command, to go into hiding, now Noctaemis, the Baron of Desolation, has claimed Briarthorn Den as his own and operates along with his small band of "Loyal" Courtiers from there. Canticle of Thorns is a nightmare court roleplaying guild aiming to, with Briarthorn Den and the Gilded Hollow, provide a consistent hub and RP environment for those wanting to get in touch with their inner villain. With backstabbing, plots, agendas, and intrigues we all strive to further the nightmare in the dream of dreams even amongst ourselves and despite the hierarchy seeming strict and rigid a title only holds as much power as the person it belongs to. We are not an alt or event based guild. We try to provide an environment where a character can grow consistently - a character concept that shows up once per month will be out of the loop and most of all stagnant. Most of us RP at least every week be it chatting around the watering hole, work to weave plots in groups of conspirators, or head out on large-scale events and missions that are part of our guild-wide plots. Absolutely no lore-breaking. If something has been confirmed to not exist in lore then don't do it. Unsure? Ask an officer. Create a well rounded, believeable and lore coherent villain. Consider strengths, weaknesses, quirks, mannerisms. If they're interesting and unique, they'll be more fun for others to roleplay with. Ask permission before involving others in your nefarious activities. Establish what your victim will and won't allow - explicit violence? Any long lasting injury? Permadeath? Effective communication will prevent any boundaries from being crossed. Face the consequences of your evil actions. If you're caught by the wardens/seraph/etc and there is no escape, then accept your arrest and punishment. Discuss with them what will happen next and try to keep screenshots of what is agreed upon. No ERP. ERP is heavily frowned upon in CoT. Absolutely no ERP is to take place in public places under any circumstances. Public places include Guild Halls and any other instances which can be accessed by players outside of your party. If you'd be embarassed if your mother walked in on you doing it, it's probably too much. Be active. Actively RPing on your Courtier character is a must. Contact an officer explaining why if you need to be gone for an extended period of time otherwise players who have not been with us for a month will be sent an in-game letter and kicked. Before you join us it is important you are aware that our Roleplay is particularly dark in nature and may consist of (In-Character, of course) physical and psychological torture, violence, gore and bullying. We allow Characters to join as they see fit, some come to us already a part of the Nightmare Court with a rank and background, while others come to us as dreamers who we will attempt to turn to the Nightmare through torture and mind-games. As a general rule it will be easier to engage us while we are out patrolling the wilds or to first contact one of the officers or guild leader in game: See contact info at the bottom of this page, or by posting a character recruitment thread here. 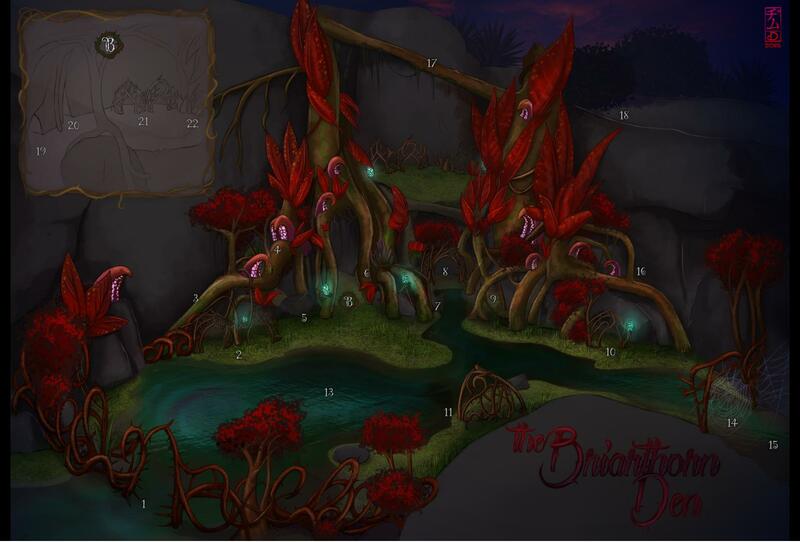 Though you are free to engage us at any time, it is important to remember that Briarthorn Den is under careful guard by elite Nightmare Court Archers, Warriors, Husks and Nightmare Hounds, as well as being laced various booby traps, so a direct approach is ill advised. You are by no means required to represent Canticle of Thorn outside of Roleplaying with us, however while engaged in Roleplay we ask for members to represent the Guild so we can easily keep track of who is who during larger events, as well as talking in Guild Chat. We welcome all Nightmare Court characters regardless of if they are mains or alts, however for the sake of character growth and development we at the very least we require you roleplay on your Courtier at least once every two weeks and would prefer members to attend big events, especially the monthly Dark Vigils. Grand Duke Noctaemis and Grand Duchess Verruh - The undisputed leaders of the Canticle of Thorns Courtiers. Knight - These high ranking members have proven themselves to be able agents of the Nightmare and are given a rank by one of the Retinue or by the Grand Duchess herself after which they may choose a title of their own, they are equally feared and respected by lower ranked Courtiers and take orders only from those of higher rank than themselves. Attendant - See below. Attendants are the Squires of the Grand Duke and Duchess. Squire - Some Knights may see fit to choose a personal Squire, these Courtiers are trained by and serve under their knight. If another Knight attempts to give an order to a Squire, then that Squire's own superior may intervene, they may not intervene however if given an order by a member of the Retinue. Courtier - Members of the Nightmare Court who have proven themselves and are considered to be a fully fledged Nightmare Courtier. Apprentice/Initiate - Low ranked Nightmare Courtiers who have only recently been turned to the Nightmare. Captive - The lowest ranking members of the Nightmare Court, these are the captive Dreamers who have been captured by the Nightmare Court and are slowly turned to the Nightmare through torture, mind games, and being forced into committing atrocities. Slaves - Slaves are the absolute lowest rank, if such a thing could even be considered a rank at all, and are the playthings of any and all of the Nightmare Courtiers in Briarthorn Den, the slaves include any Asura, Charr, Humans and/or Norn who have been captured and brought back to the Den as well as some particular Sylvari who have earned the personal ire of Noctaemis and Verruh. In order to strengthen the grip of Nightmare over the Dream, three sects, known to the Court as Branches have sprouted from the vines of Briarthorn, and every Courtier below the charge of Squire is ordered to join one of them. The Branch of Strife - The core army of the Den, specialized in both defense and offense. Those who choose to join it are to be trained physically and mentally and reforged into fierce, disciplined soldiers, the swords and shields of the Den. The Branch of Renewal - Healing, restoration and construction lie at the heart of this Branch. Whether your Courtier is a mender, a shaper, a builder or a craftsman, here they will have the possibility to hone their abilities, aware that the other face of Destruction is Creation. The Branch of Knowledge - The military intelligence of the Den. Fine skills and a cunning mind are required, for the Courtiers who embrace the Branch of Knowledge are mainly spies, assassins, traffickers, trackers, saboteurs and scholars. Intel gathering and experimental magic are quite common activities within this Branch. The Dark Vigil is the monthly public event hosted by the Canticle of Thorns in Briarthorn Den. The thread for the Dark Vigil event can be found here. Briarthorn Den is our guild HQ and only safe haven both IC and OOC due to hostile NPC Courtiers everywhere else in the world. As such, the Den will be treated as an unassailable fortress and any attempt to attack it or the Courtiers within will be met with extreme and violent IC repercussions. OOC communication is key! We simply want to create a fitting theme to make our characters grow, and hope that you will join us! As mentioned above we hope to create a Nightmare Court hub where we can boast, socialize, develop our characters and have fun! When partaking in duels or outright torture, we will always whisper to ask what your limits are. Please be mindful of others and ask permission before physically hurting your fellow players. They might have long-term plans for their characters! Moderation will be offered for all formal duels and challenges if necessary. I entered Briarthorn Den, now I'm disguised! It happens to the best of us. Simply grab an Unbreakable Choir Bell, stand over by the hero point in the far back, use it, and you should be back to your normal self. The stink of rotting flesh envelopes the large gates, where sharp thorns keep the gates closed both from unwelcome entry and unwanted exit. The putrid smell comes mainly from the severed heads and other body parts of the Court’s enemies, that adorn the unused thorns like morbid Wintersday tree decorations. Some look old, years old, left only as skulls; others seem only to have parted from their bodies days ago. The guards remain on the inside of the Gates, able to re-enforce the plant if needed, or to shoot unwanted visitors from the safety of the fortification. These cages are the first home of most captives who enter the Den and is where many of the current Court started their journey. They are made up of layers and layers of thorny wood, tempered and nurtured by the courtiers to only react to the nightmarish energy they feed the plants each day with. This causes the plants to only move to the will of the Courtiers. A Dreamer thrown into the cage will be expected to open their cage on their own, when the Nightmare sets root. A Null Field surrounds each cage, stifling any attempt to use magic inside of them. A pathway leading up to the many sleeping huts. This thorny root is climbable and many courtiers dare its slippery path only to find some solitude and shut eye in the huts above. These small but comfortable huts can be found in various places around the Den. They are usually large enough to hold one or two courtiers along with a few possessions. To get to them one will have to climb, which offer added protection should the Den ever fall under attack. A place to meditate in the rush of the busy Den. This flat stone makes for a comfortable resting place out of the immediate glare of the wind and rain. Here is a place to rest, regroup and enjoy the company of others. A small fireplace can be found here as well, for those wishing for something warmer. This throne positioned on top of a great root has gone through various changes in the last two years. From its once massive Ambrite crystal covered form into the smoldering mess left by the inner conflict of the Court, into the now regrown purple form. Remade by Duchess Verruh to fit two, both Duke Noctaemis and herself, it now towers over the remnants of the old throne, its sharp ragged edges glowing gently in an unmistakeable tone of purple corruption. Like all her plant shaping, it's tainted with essence of herself, causing it to light up in an unusually bright glow at her touch. The roots hold the place the Duke has chosen as his. The few possessions he and Verruh keep are mostly there, along with sleeping furs and such things. Underneath, the roots offer a small hiding place for those less willing to enjoy the activities of area nr 5. The path also leads to the more hidden areas of 8 and 9. This used to be a cage, but the residential head engineer and current Baron of Machina converted it into a workshop/garage. 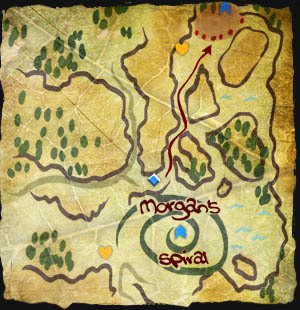 Recently, it has been turned into a ruin by the Mordrem swarming the Den. Some Courtiers like to rest or hide here, it offers a slightly covered resting point. Although it started life as a normal cage, it has been ungraded into a proper hut. It has a roof-like ledge over the top, so rain doesn’t drip in, and a canvas tarp over the front door to grant some amount of privacy. Inside, it’s a reasonably equipped first aid room: there are two rope beds on either side, each provided with layers of leaves and tall grass, shelves and drawers containing medical supplies and usually one of the residential menders. It's the plaza, or the courtyard. Despite the water, it's mostly used for everyday activities, training and the Dark Vigils. Unlike the main gate this one is smaller, much better hidden and above all guarded by the resident spiders. The gate should only be used with a beast master there to keep the spiders at bay, unless your character wishes to die a most painful death. It's not too hidden, but rarely used. Mainly only the beast masters walk it, and most of those who dare to cross it without their aid often end up as spider food. It's not a entry point. The bridge is mostly used by the scouts and guards of the Den. it leads to the upper levels of the Court, where one could find various walkways around the canyon. These walkways criss-cross the mountains and provides excellent vantage points for the scouts and guards to keep the Den safe. This walkway leads to the kitchen and the pantry, here, large and small meals are prepared and often consumed. The pantry holds everything from wine and grain to game meat and dairy. Some foods are easier to come by than others, but a general selection can usually be found here. Here, the Court spends much of their down time. The cave leads both to the inner parts of the Den and to the resting places of the courtiers. Small alcoves and pods make up the courtiers’ personal homes. And deep inside where only courtiers of high rank or with allowance may go, are the conversion pods, rarely used but functional. In the smoldering core of the Den, the Nightmare vines coil and slither into twisted and most captivating shapes. These cages differ from the rest, for they are made to hold Courtiers. Unlike the others, they do not react solely to Nightmarish energy; instead, they are magically rigged to only open from outside interference. They cannot be opened from the inside, not even with the Nightmare to aid, nor will they allow any magic to be used inside of them thanks to the Null Field surrounding them. Only fully fledged Courtiers are allowed up here, but the view might be worth the effort. Here Arches are often found, watching over the Court below, but many Courtiers go there to simply relax and enjoy the sight. Guild Recruitement is now CLOSED while our current guild plot is taking place. During this time we will not be able to spend time in the Den with captives and will be very suspicious towards newcomers, even if they are already courtiers. It will open again when the plot is over. I was wondering. Are you doing convertion to of Dreamers to Nightmare or do you take only already Nightmare characters? We do convertions, quite often over the spand of some time, at whichever rathe a caracter may take to change. I've just returned to GW and while I'm still getting used to it again, I'm really hoping to get back into the roleplay and this guild sounds very different to what I'm used too which I like! Would making a new Sylvari be applicable to the guild? Absolutely, we'd be more than happy to accommodate any new Characters as long as they fit the theme of the guild. I've been RPing in the CoT for sometime, and I had my share of fun events, whether it be intrigue, or just brutal rampage across the country ^^ They are among the best Evil RP Guild in PS. In short, if you want to be bad, rad and just a tad insane, CoT fits you perfectly. Heck my character had a thorn impaled through his shoulder, got pushed off a cliff and ended up plucking his own eye out. . Fun times ! T.L.D.R: Join the dark side.